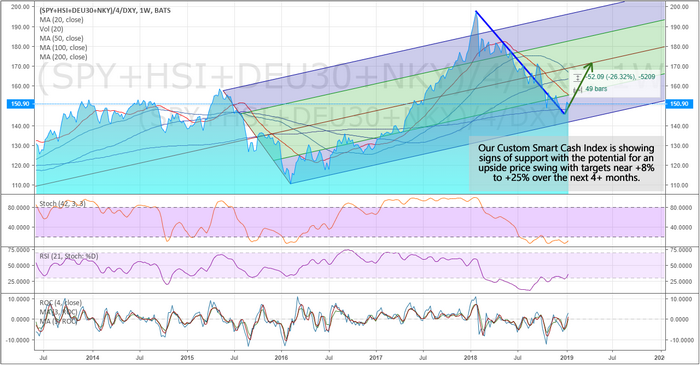 One item to pay attention to is our Custom China/Asia index. 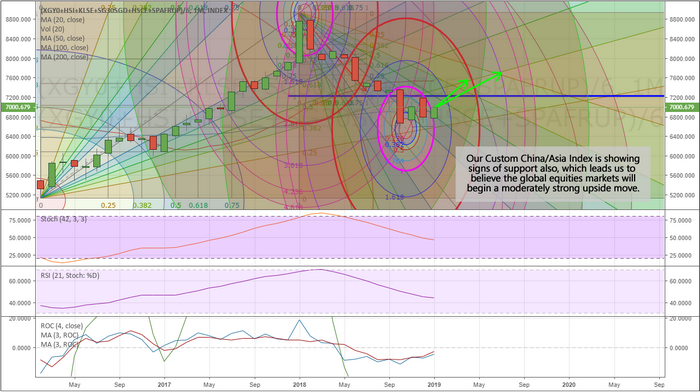 This chart, below, is a Monthly Custom China/Asia market index. It may be somewhat hard to understand with all of these Fibonacci Arcs drawn on it, but to us, this is a very clear chart. These Arcs are an advanced way to look at Fibonacci price support and resistance. We look for how these arcs relate to price activity and how they converge in past and future price points. Our belief is that each price move initiates and perpetuates with a certain energy level and frequency. If we are able to identify this level and frequency, then we may be able to attain greater knowledge of the future price turning points, support, resistance, and other key information. As you can see, the bottom on this chart occurred right within the Top Arc's primary frequency levels near 4.5x the base frequency level – or 2x the immediate frequency level. This is a fairly common level for the price to form tops/bottoms. 2X equals 200% of an immediate price level energy frequency. We believe China/Asia may experience an upside price swing of nearly +8 to +15% over the next couple of months as the global markets attempt a price recovery. This means that there may be some opportunity in the Asian markets through April/May 2019. We urge investors to be cautious of the Summer months of 2019 because we don't expect this move to last long.